An appeal to Aman ki Asha from the family of Dr S. M. Khaleel Chishty, retired Pakistani professor detained in India for nearly 19 years now is gaining momentum. Prominent Indians film director Mahesh Bhat, journalists Jatin Desai and Kuldip Nayar, and activists Admiral Ramdas and Kavita Srivastava have appealed to the President of India as well as the Governor of Rajasthan for Dr Chishty’s release on “humanitarian grounds”. Indian Home Minister P. Chidambaram has requested case details, and the Indian media is picking up the case in a big way, with at least one TV channel (News 24) taking it up like a campaign. 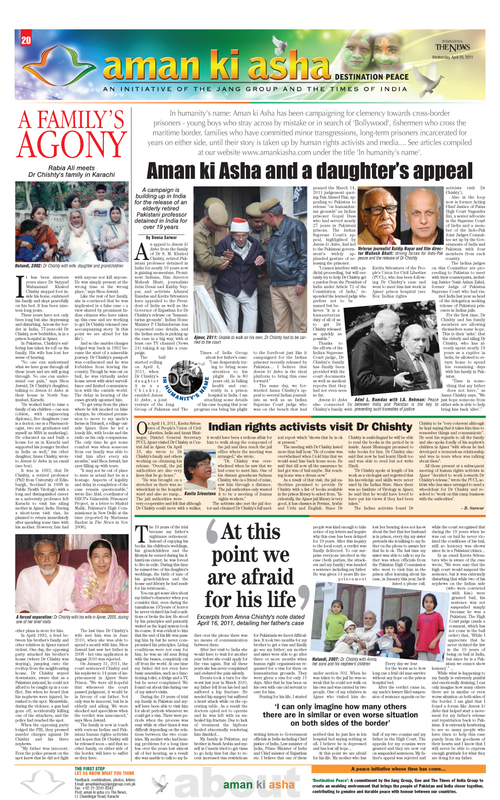 Aman ki Asha page in The News, with several reports related to Dr Chishtys case. The same day, we forwarded Amna Chishty’s appeal to several Indian journalists as well as an Indian Supreme Court judge who was on the bench that had penned the March 14, 2011 judgement quoting Faiz Ahmed Faiz, appealing to Pakistan to release “on humanitarian grounds” an Indian prisoner Gopal Dass who had served nearly 27 years in Pakistani prisons. 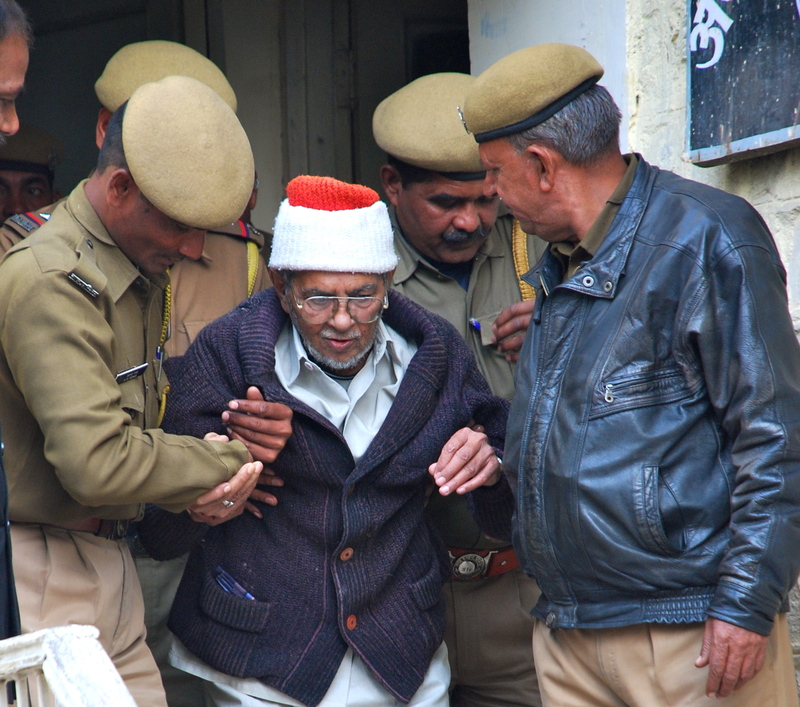 The Indian Supreme Court’s appeal, highlighted by Aman ki Asha, had led to the Pakistani government’s widely applauded gesture of releasing the prisoner. Thanks to the efforts of the Indian Supreme Court judge, Dr Chishty’s family has finally been provided with the court documents as well as medical reports that they had not even seen so far. Aman ki Asha also connected Dr Chishty’s family with Kavita Srivastava of the People’s Union for Civil Liberties (PUCL), who has been following Dr Chishty’s case and went to meet him last week in Ajmer prison hospital (see ‘Indian rights activists visit Dr Chishty’). Also in the loop now is former Acting Chief Justice of Patna High Court Nagendra Rai, a senior advocate in the Supreme Court of India and a member of the Indo-Pak Joint Judges Committee set up by the Governments of India and Pakistan with four members from each country. The Indian judges on this Committee are proceeding to Pakistan to meet with their counterparts, including Justice Nasir Aslam Zahid, former Judge of Pakistan Supreme Court who had visited India last year as head of the delegation seeking release of Pakistani prisoners in Indian jails. For the first time, Dr Chishty and his family members are allowing themselves some hope. This is their ‘asha’: that the elderly and ailing Dr Chishty, who has already spent nearly 19 years as a captive in India, be allowed to return home to spend his remaining days with his family in Pakistan. @Beena Sarwar: Great Job Beena. God bless you. How did Dr.Chishty get into this messy problem? My sympathies are with him and his family and hope he will be reunited with his family in Pakistan soon. Thanks. To see details of his case, read his daughter Amna’s account at this blog “Dr Chishty incarceration: details from his daughter Amna Chishty” (excerpts published by Aman ki Asha) also.